Music and Transcendence (Ashgate, July 2015). 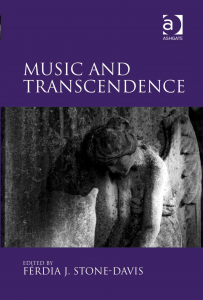 This edited volume explores the ways in which music relates to transcendence by bringing together the disciplines of musicology, philosophy and theology, thereby uncovering congruencies between them that have often been obscured. Music has the capacity to take one outside of oneself and place one in relation to that which is ‘other’. This ‘other’ can be conceived in an ‘absolute’ sense, insofar as music can be thought to place the self in relation to a divine ‘other’ beyond the human frame of existence. However, the ‘other’ can equally well be conceived in an ‘immanent’ (or secular) sense, as music is a human activity that relates to other cultural practices. Music here places the self in relation to other people and to the world more generally, shaping how the world is understood, without any reference to a God or gods. The book examines how music has not only played a significant role in many philosophical and theological accounts of the nature of existence and the self, but also provides a valuable resource for the creation of meaning on a day–to–day basis.